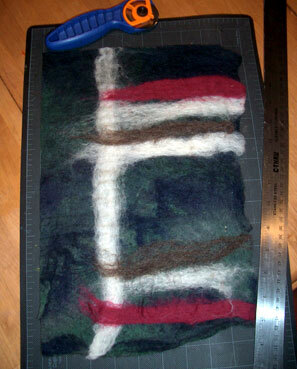 What do you do with a big piece of uninspired flat felt that has been hanging on your felt clothesline for too long? Applehead had a great idea, but I wanted something that required a little less measuring and cutting, so I worked out this alternative. 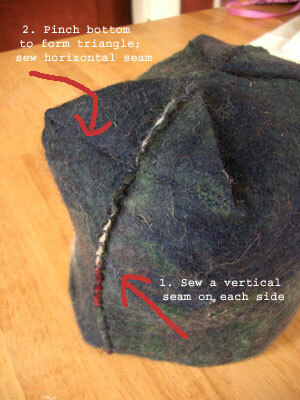 There are four straight seams, which can be done with a sewing machine or by hand. Trim the long edges as these will be your side seams. The short sides can stay wavy to give the top edge a sculptural look. Seam the sides, and then create two triangles on the bottom. This will take a little pinching and fiddling, but you should be able to get a nice triangle; the size of your triangle will affect the shape of your ultimate box. If you want something square, your triangle needs to be fairly deep; a shallow triangle will create a box that is more rectangular. You can either tack down the little flaps with a couple of stitches, or trim them off. The bottom and side of your box will look like a neat “T”. and the Felt Box from the left. I love this shape so much, I plan to make many more pieces of flat felt just so I can seam them all up. These will make great project baskets to further clutter the area around my easy chair. Hi Leah, thanks for visiting my blog – I’m so glad you like the green cables hat, and yes, it’s perfect for a quick giveaway knit. 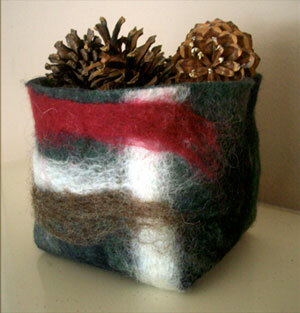 I love your work….take a look at my wine cozies on my blog (there’s a link to the pattern on the sidebar) – the end product comes out like your vase, but they were felted after knitting. Very cool! You are so incredibly talented. 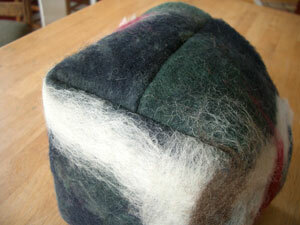 I love the felted box! i just wanted to let you know that I stummbled upon your site – I love it!!! You have great pictures and lots of detail….perfect for a lonely Friday night. I am new to felting, began last fall, and like needle felting a lot. I haven’t produced many pieces but continue to probe along. My problem is my hands and fingers have become numb and stiff and really painful. If I do not felt daily the problem lessens. Too many years of detailed art work I guess. Anyhow, if you have any suggestions to easse my pain I would love to connect. 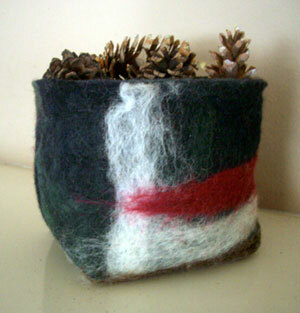 Also does one have to full a needle felted piece? 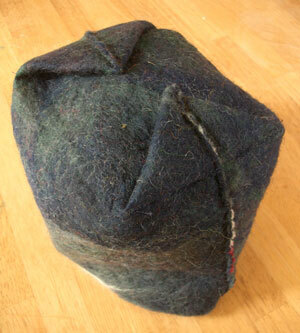 Should I wet felt it into a rigid piece by hand, or toss it into the washing machine with towls around it? What have you experienced? Your husband and son are adorable – you have a lovely family, good internet energy, and your work is lovely.